All My Gods is rated 4.2 out of 5 by 185. Rated 5 out of 5 by cynbabe from Fun Love the game! It's fun challenging, it could be a bit easier to get money, lol. Rated 5 out of 5 by Billybadass4018 from Definitely worth a try! This is a fun building game that always has goals to complete until reaching the end of the game. The awesome thing is you can continue to play the game after you beat it but there's not much to do besides rearranging and decorating your land. Although not a challenging game it's still very fun and you can play for hours without ever wanting to stop. I beat the game in a just a few hours. Just long enough for my husband to get home and quell my boredom. The story is fun but you sometimes wonder why would anyone want to mess with the god of war? Just kidding. Rated 5 out of 5 by AdrianaIP from Play your day away... I really manged to waste a lot of time playing this. Too many tasks left undone because I was having the time of my life with this. If you have plenty of time, and do not mind spending it in a non-productive activity, this is the game for you. It is that addictive. Rated 5 out of 5 by Developer_Gamer from God mode on! Who wanna be god? Excellent game! Rated 5 out of 5 by issiplays from Cute, Fun, Better the More Times I Play I am addicted. There are other time management games out there that didn't hold my interest. The storyline is a little hokey, but fulfilling the challenges is fun. The little characters are wonderful, all responding in different ways depending on what happens. I am almost done with my 3rd time through the game. Each time, my way of building varies. I like being able to arrange and re-arrange the different industries. And, so far, I look forward to the next time I play the game all the way through so I can organize differently. Rated 5 out of 5 by Chase_ from Wow! Now THAT was a good game! It plays like one of your newer Facebook games without the need to constantly ask you friends for help or run out of energy to do things before you can play again (or spend money to continue), which to me, is totally awesome. The fact that you can move things around wherever you want, and whenever you want is another great thing about this game. I was addicted right from the start. My only wish is that the game lasts longer, but you can play it over and over to create your city in as many different ways as you want to. The only thing about this game that i could suggest to improve it would be to make it so that we can rotate the buildings. But it's definitely not a deal-breaker! I will be playing this game many times! Well worth my money! Rated 5 out of 5 by HorseDancer1 from Interesting and challanging game! This is an interesting game. It took me a bit to get into the "headset" of the game's designers. There are some tricky problems that require more thinking than many games of this type. When I went to the forum pages for help, it was obvious I was not the only one trying to figure out how to accomplish different tasks. I did NOT like the "Prepare to Die!" chant coming from the religious area. But other than that, once you figure out that more is better it is a fun and challenging game. Rated 5 out of 5 by merbzy from Awesome This is seriously one of the best games I have ever played from this site! If I was ever forced to make a complaint it would be that it is to short lol, and only because I wanted it to go on for longer although it did take me about six straight hours to beat lol. Rated 5 out of 5 by Pocketmouse from A Fantastic Way To Kill A Few Hours I really enjoyed playing this game. I bought the full version as soon as my trial expired because I was so hooked. The only downside is I was able to beat it in less than 12 hours. The game is fun and easy. Not extremely challenging, but still a fun game. I recommend that you buy this one when it goes on sale as I did because I don't think that it is long enough to be worth ten dollars. Rated 5 out of 5 by SDSAngelBaby from Fun game! I actually liked this game because it gave more of a challenge. The best part was trying to figure out how to put out all the fires quickly LOL (play, it, you'll get what I mean). This is a pretty great game! Rated 5 out of 5 by Jude_Navarre from Fun, Long Sim Game - Will Keep You Entertained for Hours Great city-builder game with lots of quests and freedom. 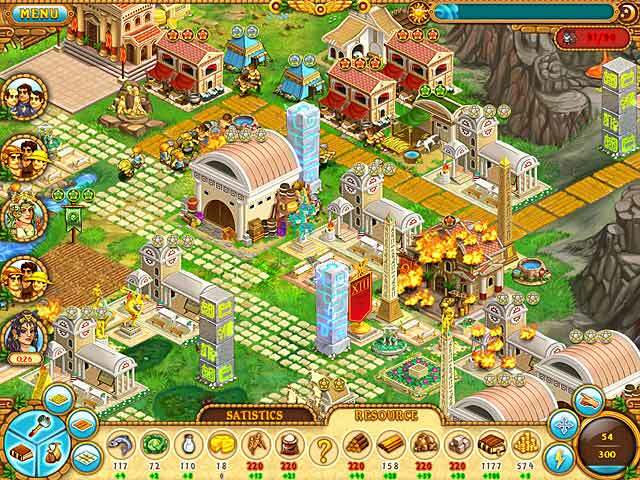 Reminiscent of games such as Age of Mythology and Black and White. Rated 5 out of 5 by rrauwdauw from Loved it! I loved the game! So I was a bit sad when I finished it.. Does anyone know any similar games? Rated 5 out of 5 by Wierdgamer100 from AWESOME GAME!!! LOVE how you build and stuff, but the challenge level could be a LITTLE better. Rated 5 out of 5 by designgirl from Great Relaxing TM Game! I really enjoyed playing this game. The story line and graphics are good and I loved the fact that you could use your god powers to move buildings, instead of having to destroy them and rebuild on another space. There's not a lot of repetitive clicking, which drives me crazy in some other TM games. Long playing time (took me a solid week, playing at night), fast-paced, and overall just a relaxing but challenging game. Rated 5 out of 5 by penguinGee from Well worth the money. I keep playing this game over and over again. With each play I rebuilt my city differently, so it never gets boring. The voiceover leaves...er, a lot to be desired, though. It was comical to hear the same male voice voicing all the characters. :) The graphics are beautiful. Love this game. Buying this is worth your money as you'll be playing it over and over again. Rated 5 out of 5 by SherrieS from Deceptively Awesome I never liked SIMs games, they stressed me out. But this one was a BLAST! What I liked: no clock ticking away Having the abilties (Godlike) to move buildings Replayability cute storyline cartoon graphics that are east on the eyes RELAXING What I didn't like: just one! not enough room--I would have really liked to have seen more area to extend the play-like where the traders where coming from-just a thought By the time the finish came-several hours a day for several days-my first go around looked like the slums for lack of room. The next time I played I learned alot & planned better--now on third go & still enjoying it immensly. Don't let the title fool you, this game had Strategy, cute characters, and so much entertainment. I was hook by the half way mark of the trial. Rated 5 out of 5 by amberplews from Absolutely amazing! I played the trial version of this game first and absolutely loved it! I obviously then had to go out and buy the full version. I was completely hooked to this game and couldn't even go to bed until i had completed the game! It's completely different to the normal strategy games that are similar to this, as you aren't just clearing paths etc you can actually build things where you want to place them. I would definitely reccomend this game as me personally absolutely adored it! Rated 5 out of 5 by EnvirEng from Wonderful Game, Highly Addictive LOVED THIS GAME. 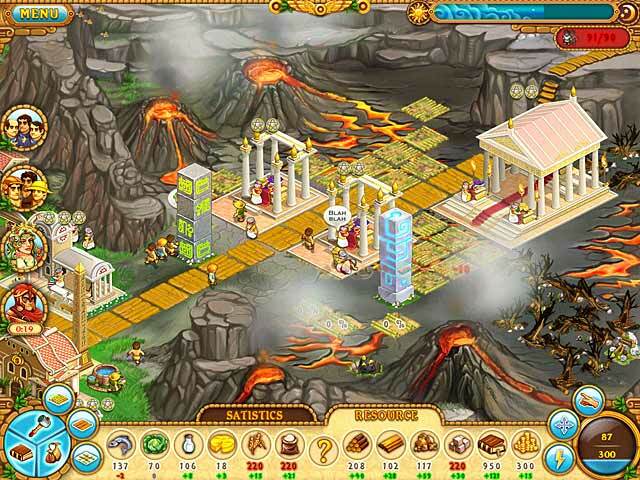 It is a resource management game. Most tasks are untimed. You need to clear land, build buildings, accomplish goals, etc. The graphics are cute cartoons. I liked the sound effects. It took me more than five hours to play through the first time. Replay-ability isn’t that great, since you know what is coming next and how best to accomplish it. You play a young male god, who just might make it to Olympus, if you prove yourself by building a city and meeting goals. You can’t choose between male or female characters. Zeus gives you an old pair of Omnipotent Gloves, which gives you some god-like powers. Manna, which you get slowly (or more quickly if you build shrines), powers the gloves. The game starts slowly and I’ve seen a number of complaints about that, but give it some time and build some temples. The glove will charge much more quickly if you have a lot of subjects worshiping you. If you build mre temples, the total amount of manna you can store increases. There isn’t much instruction, so you have to figure out things as you go. It took me quite a while to learn that the gloves can also put out fires, complete buildings, make workers work much faster, and quell worker protests. Also, that gold mine is pretty useless. Start selling stuff at the market a.s.a.p. That is the fastest way to get gold. 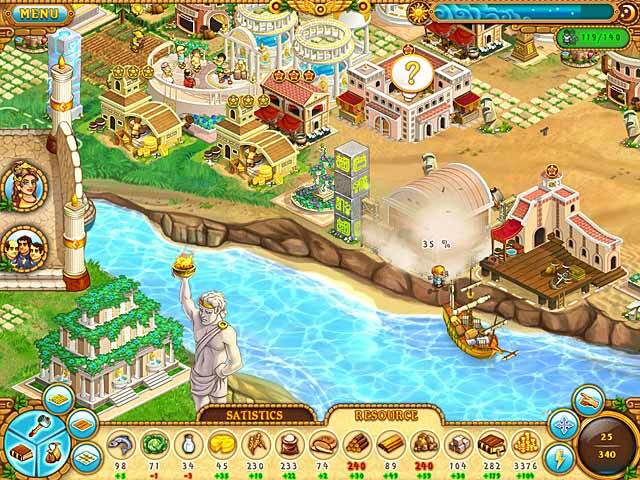 During the game play, the goddess Venus stops by to flirt and ask you to do things for her (like build fountains and arbors). You need to fulfill her wishes, but then her husband (Mars, the god of war) shows up and sets your buildings on fire. In the end, it all works out. Tasks are lined up on the left of the screen and disappear when completed. As you progress, more land becomes available; each area has special features (volcano, desert, island for monuments). Each also has a special task that needs to be completed (find Mercury’s sandal, rescue prince from giant spiders, explore UFO). All My Gods is more complex than many in this genre. Besides keeping your subjects fed and housed, you also need to collect education points and learn new skills, so you can build grain mills, open trade ports, navigate, build monuments, etc. I really enjoyed the challenge of figuring out what to do. For me, the second play-through wasn’t as much fun, but it sure was easier. Younger children might find this game frustrating. Overall, this is a great game. You need some patience, initially, while you figure out how to maximize your abilities. I strongly recommend it, but keep one thing in mind. There is one, over reaching mission and there are no chapters or divisions built into the game that act as natural break points. As a result, I played for two or three hours straight, when I began. Don’t start unless you have a lot of free time on your hands. Rated 5 out of 5 by InglouriousCobb from Addicting and very fun Played demo and was immediately hooked. I love these type of management games and have to add this to one of my favorites. The story is fun and entertaining. Quests given by the other gods succeed in moving the story along. Rated 5 out of 5 by AuntieCod from I had fun with this one I liked this game. The graphics are cute. I really liked that you can move a building if you have to. Destroying and rebuilding them as in other games is always such a pain. I had to hand it to the designers for that. It was relaxing and like eating peanuts. It's easy to get sucked into the "just one more thing" aspect of the game. Before you know it, a couple of hours have gone by. Who wouldn't have fun playing at being a god? And you are one for this little town. Definitely give it a go. It's a fun, relaxing little time-waster. And that's what a game should be! Rated 5 out of 5 by Talamasca from Fun for hours! This game was very fun, and provided more length of gameplay than most other games. Once all your main quests are done, it is very fun to go back and try to get all the bonuses, like destroying 30 of your own buildings!!! Rated 5 out of 5 by megs56 from ABSOLUTELY BRILLIANT I love this sort of time management game. There are numerous upgrades (ie courses to complete, things to build) the storyline is engaging, graphics are cute, as a god you have mana to spend on putting out fires, fast-tracking resources. It's wonderful and long, really really worth the money. Rated 5 out of 5 by Flashgirl_01 from Just play it! I play this game without break! The characters are very cute and the story and quests are nice! This game is only fun! Just play it and you will like it! You must help a civilization to learn and grownup to become a modern world and a great god! Rated 5 out of 5 by manpreetapr09 from Very addictive game..loved it!! Bought it immediatlly. Good graphics and storyline. 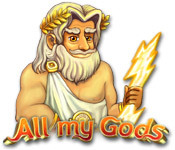 Lead Saturn's son to the top of the Pantheon and help him become a mighty god in All My Gods! Use divine powers to change the life of Romans!